I have written an article about demolition of the Evergreen Building which was constructed in 1980 and designed by Arthur Erickson. Since then, I felt very sad every time I passed this building, however, I found out yesterday that this demolition was cancelled! According to the City’s report, the city considered the building as an important historical building and provides compensation to assist to preserve the building. Two options were suggested to the owner of this building; one is to add 5 stories for residential use and the other is no additional stories for commercial use. Either way the building will be preserved and I am very happy to hear this. 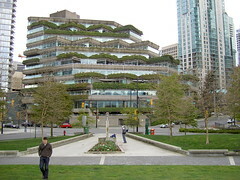 Arthur Erickson exhibition will be held at the Vancouver Art Gallery from Saturday, May 27th. I am looking forward to visiting there.